As discussed in an earlier posting, the Okinawan master, Sokon “Bushi” Matsumura was a central figure in developing the now familiar linear technique, at a time when most martial artists on Okinawa were still using the circular techniques of Chinese origin. As discussed in that posting, Matsumura was also the head bodyguard to the King of Okinawa and the bodyguards (like all Okinawans) were not allowed to carry weapons by Japanese decree. This left a situation where the bodyguards could end up fighting a superior number of assailants, who might also be armed. That previous posting discussed how the linear technique would have helped take the fight to the opponents and dispatch them as quickly as possible (necessary when facing larger numbers). Taking a step further back in history, the earlier Okinawan masters had developed a system that included all modes of combat. This would include striking, grappling and weapons. Although Matsumura developed the linear technique and clearly emphasised the “one hit, one kill” philosophy which we are very familiar with today; Matsumura and his men would clearly have needed some grappling skills. They would not be interested in taking a fight to the ground where others could kick them on the floor and they would not be interested in the time taken to gain a submission when others would be attacking them. However, they would be particularly interested in knowing how to release any kind of grabs or holds and release them very fast before others came up to hit them. 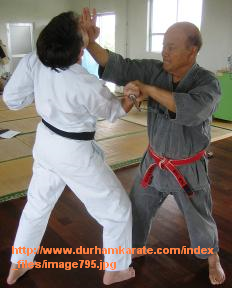 Matsumura is believed to the be the author of Bassai Dai (also known as Passai or Patsai), which is still practiced in may styles of Karate and Tang Soo Do. When you look at the opening sequence of Bassai Dai just after the forward thrusting back fist strike/block, you turn 180 degrees and perform 2 chest level blocks, turn 180 degrees again and perform 2 more chest level blocks, then turn 90 degrees to the right, scoop low and perform 2 more chest level blocks. When you stop to think about it, this is a bazaar sequence. Firstly, Matsumura was known to be a man who studied his enemies, and in this case his enemies would be angry Westerns wanting to trade (and being rejected by Japanese order). Matsumura would know that these “barbarians” would not practice straight lunge punches, but would more likely swing at the head. Secondly, why do so much blocking and not hit back? You’ve just blocked 3 people and they are still standing, still wanting to hit you! The defence is not geared to the likely attacks and still leaves you vulnerable at the end. Was it that Bassai Dai was more for character development than for actual fighting. Matsumura was practical, clever, ruthless and fanatical about martial arts. It is very unlikely that he would author a kata that did not have very practical, effective and ruthless fighting movements from start to finish. So what conclusion can we draw? The obvious one is that this sequence of 6 chest level blocks are in fact, nothing to do with chest level blocks. Bearing in mind that Matsumura’s men would expect to be outnumbered, should a fight break out they would expect to be grabbed from all directions. So try practicing this sequence with a partner. Have them grab you in various ways from behind, then turn and perform the double blocks. You will find that most grabs will be knocked off and as you are moving into your opponent/partner, you will find that the second “block” can often be used as a close quarters strike. My Sensei, Paul Mitchell always says that Bassai Dai is a grappling kata. Not grappling as in the sporting sense, but to release attackers grabs and line them up for a finishing blow. He also says that Karate is “a kind art” as it teaches you to strike first (which is the easiest way to dispatch somebody) and grapple later. However, when learning to strike we place a great deal of emphasis on stance and posture which some people decry as unrealistic and static. But that stance and posture gives you the balance and stability that you need when somebody has grabbed you and is trying to shake you about as you try to release them. Furthermore, the mobility that we are supposed to lose by using these stances are more valuable for sporting contest than the reality of the street. This may seem strange to some people if they are reading these type of ideas for the first time, but the more you analise it, the more you realise that it is the only logical conclusion. Our own DVD on Bassai Dai and its bunkai is now available at our store. Posted in History, KarateTagged bassai dai, karate, karate grappling, okinawan karate, passai, patsai, sokon matsumura, tang soo do2 Comments on Bassai Dai (Passai): Grappling Kata?